I have been going through some of my old posts and updating tags and things and I came across this one and thought I would re-post it as a not-so-wordless wednesday post for everyone that missed it first time round (which is most of you! Lol!). I have been looking for this picture for a while and I finally found it on my computer at work. This is one of the very first pictures I took when I first got my new, old camera. The Canon I had before I got this one. This picture was taken at Mr.P's parents place at EK at night-time when it was completely dark. And being in the middle of woop-woop it was really dark. 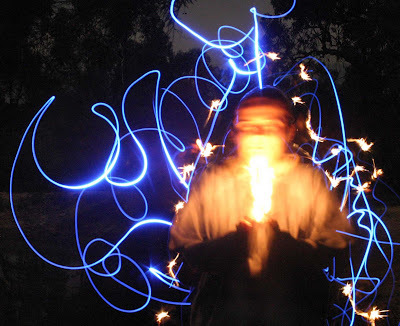 I have set the camera up on a table in the backyard and set the shutter speed to 30 seconds. I am standing completely still holding a lighter up to my face while Mr.P and the D-Man walk around me, one with a little LED light and the other with a lighter just flicking it so it sparks. And this is the end result. I kinda like it. Its different. I look like I'm super-imposed over the background. We talked about this @ Photography class, can't wait to play around with it. That's lovely. I would love to be able to take photos like that.